A few weeks ago, I received a few items from Born Pretty to review. I love browsing Born Pretty for nail art supplies! They have a ton of items and free shipping, what could be better? One of the items was a set of dotting tools. I've wanted to try more adventurous nail art, so I thought that these could be a great way to get started. Dotting pens can be used to make dots or to do hand marbling. I think I'll need to watch a few you tube videos to learn a few tips, but I am excited to try a my hand at it. 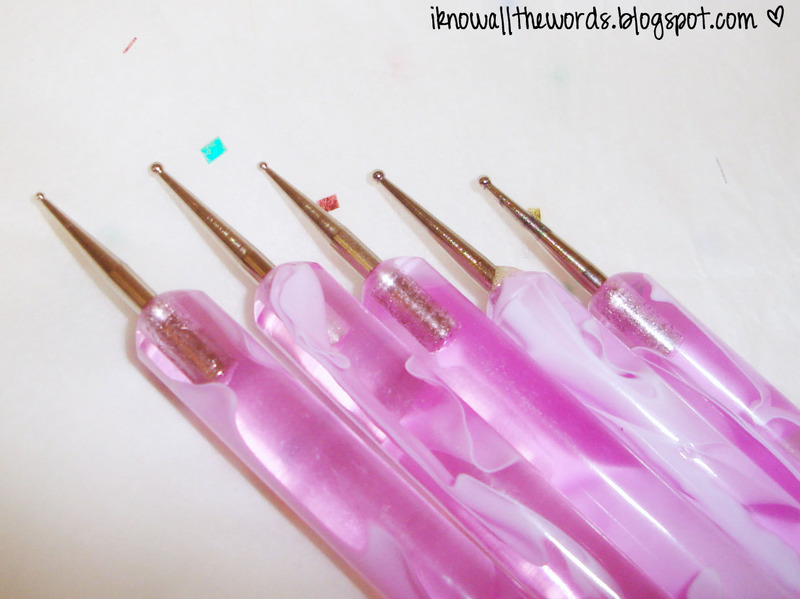 The set includes 5 double ended dotting tools, giving you 10 different sizes to suit your nail art needs. I used a few different sizes to get used to them, and I have to say they are super easy to hold and use. They are light enough to hold and use easily, but have enough weight at the same time that you know they aren't going to snap or bend on you. It was really easy to pick up a bit of polish and get perfect dots. I think it would look great to do a graduated dot design with these. My first attempt at doing a flower with the dotting tool didn't go so well. I was having an "off" day and just couldn't get my hand to cooperate. My flower is a bit wonky, but it kind of reminds me of a Warhol flower. The base polish is Essie Nice is Nice, the yellow is China Glaze Lemon Fizz, the centre is OPI Lucky Lucky Lavender. I wanted to try my hand at something a little more different for my second attempt with the dotting tools, so I did a set of googly eye friends to keep me company. To start I used a pastel skittle base: Nicole by OPI in "Baby" Blue on thumb, Essie Nice is Nice on pointer, China Glaze Lemon Fizz on middle, China Glaze for Audrey on ring, and OPI Lucky Lucky Lavender on pinky. I did both hands in the same pattern, I didn't want to look totally crazy. Once the base was dry, I used the second largest dotting tool to paint the white background of the eyes. I put a few drops of the polish into a little bowl to dip into it. I made two dots on each finger (unless you want little cyclops, you could stick with one.) When the white was dry I added the black for the pupil using one size smaller dot than I used for the white dot. I then let it dry for a good 8-10 minutes before topping it with Sally Hansen Mega Shine top coat so it didn't smudge. Voila! You're done. What is your favourite type of nail art? This item was sent for the purposes of review, but no compensation was received and all opinions are honest and my own. I need to get one of those dotting tools, I love polka dot nails! The Physicians Formula Rx Strength concealer is not too good. It's heavy and chalky, but I manage to make it work by applying it under my eyes. 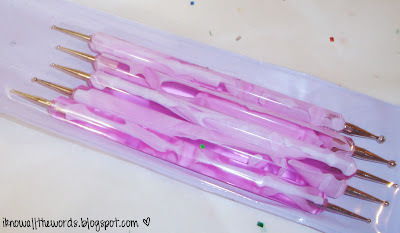 I bought too theese dootting tools, but, there are not 10 sizes, because there are two pens equal, two more equal, and one more. So really there are one big, one medium, one little medium and one small. 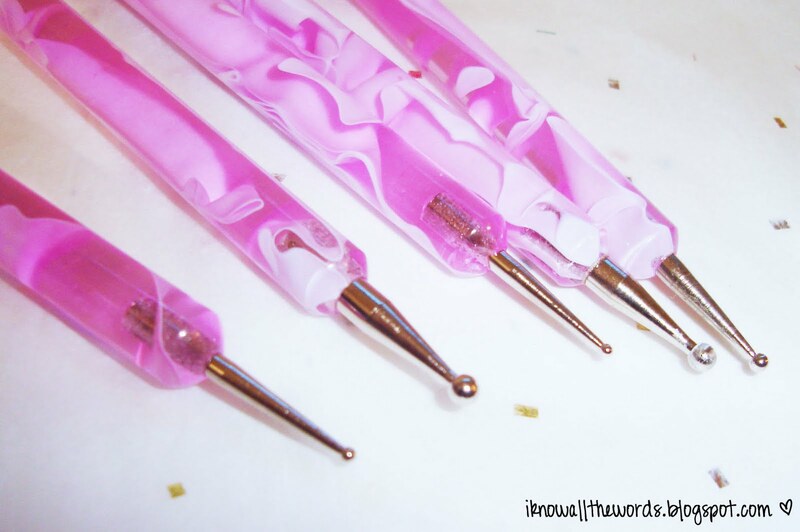 Pens are repeated in size!